Best Mops for Hardwood Floors (Reviews 2019) – Can I steam mop my hardwood floor? Battery Asking » Cleaning » Best Mops for Hardwood Floors (Reviews 2019) – Can I steam mop my hardwood floor? Do you want your hardwood floor to appear clean and shiny after mopping it? It can once you know the secret behind it. When you use a wrong mop for your hardwood floor, it might be hard to bring out that shiny glossy look you would wish for. It does not matter the type of hardwood your floor is. All wood floors can appear dull, off-color, and sometimes leave streaks of dirt when you fail to clean them in the right way. To maintain your hardwood floor, you don’t leave it at only sweeping, but you need to mop it clean using one of the best mops for hardwood floors. It will not only regain the shiny and glossy appearance, but you will protect it from the harsh abrasive cleaning. “How will I know the best mop for my hardwood floor,” you may be wondering. Don’t worry! We have sorted you out by carefully and intensely selecting top best eight mops for hardwood floors in the market for your quick selection. Follow the conversation right here to get what suits you best. Q: Can I steam mop my hardwood floor? Q: How often should I mop my hardwood floor? Q: How can water damage my hardwood floor? Q: Is it safe to use vinegar on my hardwood floor? What is your best mop among the top picks in the list? You wouldn’t want to try anything else once you get hold of Bissell PowerFresh Steam Mop. It is everything you need for your hardwood floor mop. The mop uses steam to mop your floor which means it dries almost instantly after cleaning it and eliminates 99.9% of germs and bacteria by steam sanitization. Bissell PowerFresh allows you to select the intensity of steam you need from low to high using its smart digital setting for steam control. It features a swivel steering with a soft microfiber pad. Also, for tough cleaning, it features microfiber scrubby pad. It is also versatile. You can use it on the tiled or laminated floor and even on your carpet since it comes with a carpet glider. Also, it tops all these with fragrance discs to not only leave your floor clean and shiny but, filled with fragrance. Bissell PowerFresh is 1500 watts electrically powered and operates with a 23-ft power cord which is enough to allow you to clean a large area. If only Bissell PowerFresh were battery-powered leaving you free to move as you want without being limited by the power cable, it could have been much better. Other than that it remains the best mop to have around. The most challenging part of using a hardwood floor mop is to wring out water. 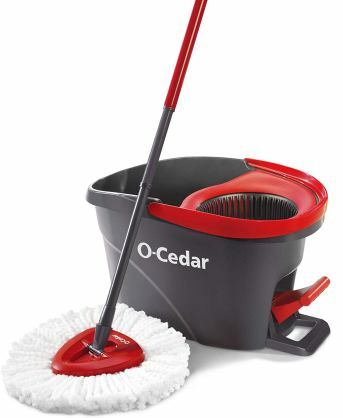 With O-Cedar, this is not a problem since it will wring using its bucket which has a unique mop-wring system. You merely hold the mop on the bucket, step on the pedal, and it squeezes out all the water. As you are squeezing, the water will not splash out since it has a splash guard. O-Cedar has high-quality microfiber which absorbs all dirt and grime no matter how tough they may appear. It removes and deep-cleans the floor to leave it glossy clean. Its triangle-shape fits all the corners easily. It features a machine-washable mop head and an adjustable telescopic handle which you can set to your suitable height up to 51” including its mop head. Nevertheless, the mop has its own flaws. First, the handle is flimsy and breaks easily. Secondly, it could do better if it had a rubber at the holding tip. Other than that, the mop and the bucket pair well to give you remarkable cleaning results. Mopnado is a versatile mop that does not select what to clean. Despite cleaning hardwood effectively, it can also clean any other type of floor effectively as well. The microfiber mop is machine washable. The mop swivels at 180 degrees which enables you to reach under low furniture when cleaning. It has a 47-inch stainless steel handle which is adjustable up to 56 inches and which is ergonomic for a comfortable hold. It can swivel up to 180 degrees when reaching under low furniture. You can also lock it from rotating when you are cleaning windows and other far-reaching places. The bucket has two handles, one for lifting it and the other for rolling it since it has two wheels. It is not easy to rinse the mop head because of the unique and sturdy mop plate made of stainless steel. The bucket also has a built-in dispenser for pouring in the washing solution. The mop set also features an extra microfiber mop head and a scrub brush. You get everything you need with Mopnado mop. However, the plate that holds the mop seems to be weak and especially the part that holds the handle. With vigorous mopping, it can easily break. Besides that one flaw, mopping with Mopnado is a breeze. The Shark Steam Pocket Mop uses steam to mop off dirt and grime from your hardwood floor. It heats water to form steam which dries quickly after using it. Using steam to mop will not only leave your floor shining clean but will eliminate germs and bacteria by 99.9%. Shark Steam Pocket Mop is electrically powered and uses 25-ft power cable which is stored in the mop to be released as you move and allows you to clean far and wide. It features the mop itself with ergonomic soft-grip handle and two microfiber pads which lift off all the gross dirt and locks it in its fiber cutting your cleaning time to half. With Shark Steak Pocket Mop, you don’t have to drag buckets of water since it has an inbuilt water tank and neither will you need chemical-filled solutions to clean your floor. Unlike other mops, Shark Steam Pocket Mop cannot clean your windows or your walls or anything else vertically. It is a horizontal use only. Rubbermaid Reveal Spray mop is a high-quality microfiber that cleans all types of hard floor including hardwood floor thoroughly and effectively. If you are looking for a multi-purpose mop, then you have it in Rubbermaid Reveal. You can connect Reveal dry dust microfiber cleaner for mop sweeping before wet mopping and also a scrubbing pad that scrubs off the stubborn spots without leaving scratches. The microfiber is machine-washable up to 100 times saving you some money on refills. You can customize your floor cleaning with Rubbermaid Reveal which has a refillable spray bottle. You will need to fill up the 22-oz bottle either cold or hot water with or without a cleaning solution. You will dispense the cleaning liquid using a manually operated spray trigger. The trigger in Rubbermaid mop is not consistent in dispensing, and the handle is not adjustable. Other than that, it will serve you effectively. 18” Professional Microfiber Mop is the mop that you may want to have for your professional cleaning. It is all set ready with everything you may need for your cleaning. It comes with one piece microfiber dust-mop pad for your pre-wet cleaning, two pieces microfiber wet-mop pads, and two pieces free microfiber cloths. The mop swivels to fit under furniture for easy cleaning. It can also clean vertically to clean windows and other vertical surfaces. The mop is a sturdy one with the 18 inches wide mop frame made of heavy-duty aluminum and a stainless steel handle with adjustable height up to 70 inches. The microfiber mops are durable since they are machine washable and thus cut costs on refills. The mop frame at 18 inches is too wide to fit well in a sink, and no mop bucket can take that size. It, therefore, makes wetting the mop very difficult. Besides that one downside, the mop is excellent on all other areas to make you a pro in mopping. If you are an ardent floor cleaner who wishes to always maintain a shiny clean floor, then Linkyo Microfiber Mop should be your choice. The reason you will choose this type of mop is that it is economical. The mop is reusable to machine wash it, and also you can use both sides of it. Again the mop is sturdy enough for long-time use. It is constructed with a metal mop frame, stainless steel handle, and high-grade ABS plastic on the mop frame and other parts of the mop. Linkyo Microfiber comes with two pc reversible microfiber wet mop pads and one pc standard microfiber pad. You can use other mop pads of your choice when you need to refill since the clip-on design of the mop frame allows you to do so. The extendable handle up to 70 inches length and the 360 degrees swiveling make far-reaching areas seem near enough for easy cleaning. What you might not like with this mop is that it is not a telescopic mop handle and thus you have to unscrew the part you don’t need to again screw-in the rest. It is for sure you want a mop that can do everything for you, and that is why you are eager to read about all this. You are at the right mop which will do the mopping for you. All you have to do is direct it to where you need to clean, and it will do the rest. It is easy to operate Bissell Spinwave since you only use the on and off button and the spray button. The mop is noiseless that unless you see the result, you might think it is not doing anything. The pads attach to mop at the bottom by use of Velcro tabs. The 18V Lithium-ion battery powered mop is convenient in mopping since it does not limit its movement by any cable or cord. It is a powerful mop that does a cleaning path of 14-inches width by gliding smoothly. The two mop pads are washable so that it can achieve the best results next time you need to clean your floor. However, it is hard to carry the mop when you need to store it since it does not have wheels. It might be too heavy for a senior person. Yes, you can steam mop your hardwood floor using the special steam mops for hard flooring. Bissell PowerFresh Steam Mop which is No. 1 in our list of reviewed products is the best choice. However, if your floor is not well sealed, then steam mopping is not recommended. Also, it is recommended to use low steam for sealed hardwood floors. Not often if you can vacuum or dry mop your hardwood floor daily if you have the time, but, if it is really dirty, then you can wet-mop it. While cleaning the hardwood floor, you need to take care of it not to dampen it with water. Wash small areas at a time and wipe immediately. To make it easy for you, try using a spin mop such as Bissell Spinwave Cordless Hard Floor Mop. Hardwood floor should not be left damp for long because it can damage the floor. To avoid such damages, dry your hardwood floor quickly and as soon as it gets wet. No, your hardwood floor has a finish treatment. Vinegar can be abrasive since it is acidic and thus wear out the procedure. Also, you can cause excessive wetness on the floor which is not advisable for the hardwood floor because extra wetness can damage the wood floor. There are softer detergents in the market specifically for this type of floor that can help you remove dirt or buildup grime without causing damage. A clean and glossy hardwood floor can only happen by extra care in the choice of the mop you use on it. The microfiber on the mop should also be the right one with soft fiber to prevent scratching the floor. The handle height is also another factor you should consider and especially if it is adjustable. The choice of your mop which is durable must be of the right height that you will be more comfortable to use it. Choose the right mop to avoid extra fatigue and backache. Please tell us about it on the comments section here below.